An upgrade of the S10e, rather than a complete overhaul, the IdeaPad S10-2 builds on its predecessor's success by adding some new features. The 10.1-inch screen is exceptionally bright, produces great colours, and is great for viewing pictures and movies alike. The screen's 1024 x 600 pixel resolution is detailed enough, and produces sharp images, suitable for viewing and editing intricate documents such as spreadsheets. There is a shiny Super-TFT screen coating in place, however, and it inevitably proved very reflective when used in bright light. The chassis is built from a solid white plastic which is more 'pearly' than 'matt' in its finish. The lid is also covered in circular patterns that certainly won't appeal to everyone, especially those with business on their mind. Nevertheless, it is relatively tough and provides adequate protection for the TFT screen panel inside. Built into the chassis are two hotkeys. The first constitutes Lenovo's OneKey Rescue System, which allows you to back up your data at the press of a button. The second is Lenovo's QuickStart system, which allows you to get online, listen to music and view your photos without starting up the main operating system. The keyboard is a mixed bag and, while Lenovo claims it is 90 per cent full sized, it feels a lot smaller. Some keys are mystifyingly large, however, such as the Shift key, and other keys suffer as a result. We soon got used to it and found it fine to work with. The touchpad is small and the two mouse buttons can be a little fiddly but, again, they get the job done. With a weight of just 1.1kg and 210-minute battery life, great mobility is provided. 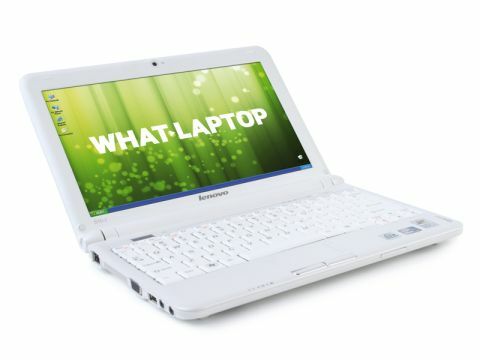 802.11g Wi-Fi will provide quick access to the internet in hotspots, and three USB ports allow you to connect various peripherals to enhance your netbook experience, such as an external disk drive to use with the OneKey Rescue System. Overall, the IdeaPad S10-2 is a decent netbook and, while its slightly fiddly user interface does detract from the overall experience, there should be enough here to attract most buyers.